There comes a time in every enthusiast’s life when they dream of opening an escape room. For some, it’s just an idle thought, but a few take the brave leap into running their own game. Amy and Ian are two such players, having created Wirral Escape Rooms, with Amy also well known as the prolific blogger behind Brit of an Escape Habit. I’d been meaning to visit for a while (they’ve been open for a year! ), but the Wirral is on the other side of the Mersey tunnel, and I’d never quite had the logistics in place to make it across. Finally, the long overdue trip became a possibility, and I booked in to see what all the bloggers were talking about. Yes – this is a game that has a strong reputation across enthusiast circles. Before I jump into the game itself, it’s worth saying that you should definitely read the booking email when you visit, because getting to this venue is a little trickier than you might imagine. Once we were there, though, there was plenty of parking and we were soon receiving a warm welcome from Amy. The majority of the story is given to you before you enter the room, explaining that you’re heading into the jungle to retrieve the Golden Lion and maybe, if you’ve time, four other artefacts. During the game, there are a couple more tidbits to round out the narrative, but the theming of the experience is most apparent through the decoration and puzzles. The set design may not blow you away with its immersiveness, but they’ve done more than enough to get the theme across and added plenty of props to help with that. For me, it felt a little too modern. That’s not to say things were inconsistent with the story – just that it’s much harder to be immersed in a world when the props in the room are everyday items. Where those items were artefacts from far-off lands, it worked much better to get my attention. Puzzle lovers will be delighted to know that there’s plenty on offer for them here, with fantastic variety. It felt to me that this game had a real focus on trying to avoid repeating puzzle styles and allowing players to build up momentum. The breadth of the designers’ playing experience and skill showed in both the variety of puzzles and in how logical they were. There was nothing here which felt remotely unfair. While the puzzles weren’t at the difficult end of the scale, they also avoided including many trivial solves. and that balance gave a real sense of flow to the experience. Expect to have to think for pretty much everything in the room but, if you’re starting to get frustrated, it’s probably that you’ve missed something rather than that you’re not understanding the puzzle. For the more experienced teams, the good news is that there’s parallelisation on offer. Although that’s also true of the normal part of the game, it really comes into its own during the bonus section. There are four optional items and, while that doesn’t dominate the experience, it does mean that enthusiast teams who are zooming through the room can expect to have something extra at the end to keep them occupied. The finale was my favourite part of the game, bringing it to a rousing conclusion and leaving us with a simple final challenge that incorporated a little bit of theatre and provided a fitting ending. We escaped with all four artefacts and around ten minutes remaining, having taken a couple of small clues on search fails. The Curse of the Golden Lion is a well-executed escape room with bonus content that ensures novices have a fun adventure while still letting enthusiasts have their money’s worth. 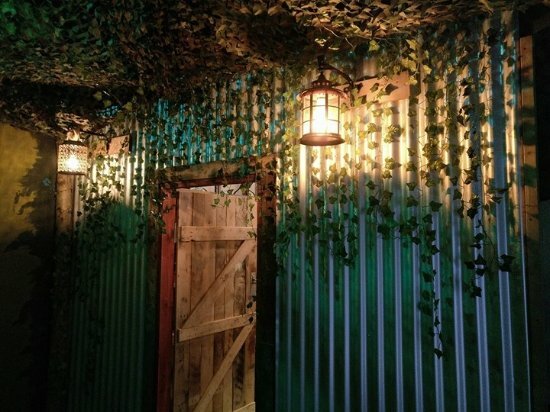 It’s not an escape room that’s going to wow you with its decoration and theatre, but there are plenty of logical puzzles, and you can see the enthusiast touch in how smoothly it flows. We played as a pair and felt there was plenty to keep us occupied. If you want a challenge, then go as a two, but I wouldn’t worry about taking a team of four – there’s plenty of investigate.